Will starters have an innings hangover? A common concern after a deep playoff run is the potential fatigue-based hangover with players. The Yankees made it to game 7 of the ALCS this past fall, giving players an extra 13 games under their belt. These extra innings most often affect starting pitchers. Though only pitching a couple games each, some members of the starting rotation are coming off of career highs in innings pitched. Let’s delve into the numbers. Sevy threw 193.1 innings through the regular season with an additional 16 in the postseason for a total of 209.1 innings pitched. His previous high was 151.1 innings in 2016 between the Minors and Bronx. That’s a fairly significant jump. A good sign might be that outside of the Wildcard blunder, Severino was dominant in September and October. A bad sign might be that 58 extra innings are a lot on an arm that’s not used to it. Tanaka accumulated 178.1 innings in the regular season with another 20 in the postseason. Those totals basically equal the 199.2 innings he tossed in 2016, which is a good sign. However, Tanaka had a rough first half of the season in 2017, pitching to a 5.47 ERA. That could be in relation to a high innings count the previous year. The Japanese hurler got better as the season went along, but the high innings counts may contribute to another slow start. Monty didn’t pitch in the postseason, but did rack up 155.1 innings in the regular season with another 8 in the Minors. His previous high came in 2016 with 139.1. That’s a decent little jump, but something that’s typical of a developing pitcher. There’s no reason to think last season’s innings will affect him this year. Do innings even matter with CC? The guy has pitched over 250 innings before. Yes, he was younger, but that’s still insanely impressive. Last season the workhorse pitched 148.2 innings in the regular season and another 19 in the Postseason. Fairly low numbers given his career. Though he’s getting older, it’s a fairly safe bet to assume he won’t be affected by that in the upcoming season. The midseason acquisition pitched 162.1 innings between Oakland and New York in the regular season with another 8.1 innings in the postseason. Though a big jump from his 117 innings pitched in 2016, Gray has pitched over 200 innings twice in his career. He’s been injured over the last several seasons, but he has the ability to pitch a lot of innings and stay healthy. He struggled down the stretch for the Yanks, but his innings are in a good place moving forward. All in all the staff looks to be in good shape moving forward, with the exception of Severino. The innings he totaled in 2017 are in a good range where a starter should be in his career. My guess is they bring Sevy back into the season slowly in order to keep his innings in a good spot. A strength of the team, the bullpen, considerably helped the innings counts of the starters throughout the season. 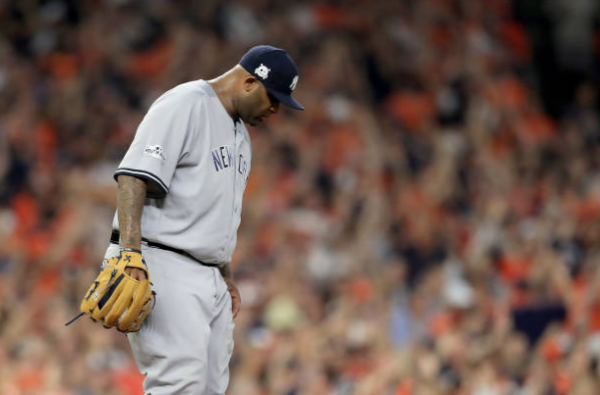 Will innings counts affect relief pitchers on this team moving forward? Stay tuned.